If you’ve been following along on our travel through Malaysia, you may have read about our road trip from Kuala Lumpur to Penang by car and how exciting that was for us. Having said that, our stay in Penang’s Georgetown was no less exciting! In the heart of this UNESCO World Heritage site is a hotel that itself has a bit of history to it. 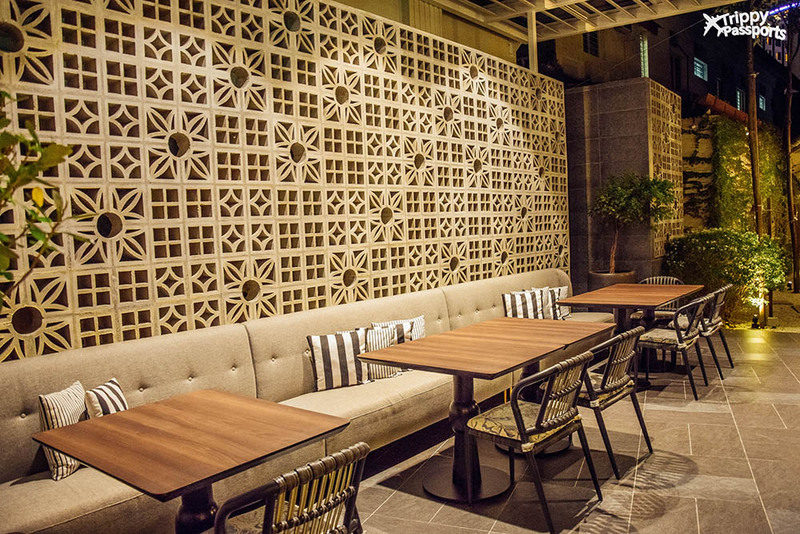 The Edison George Town is more than just your regular city hotel. 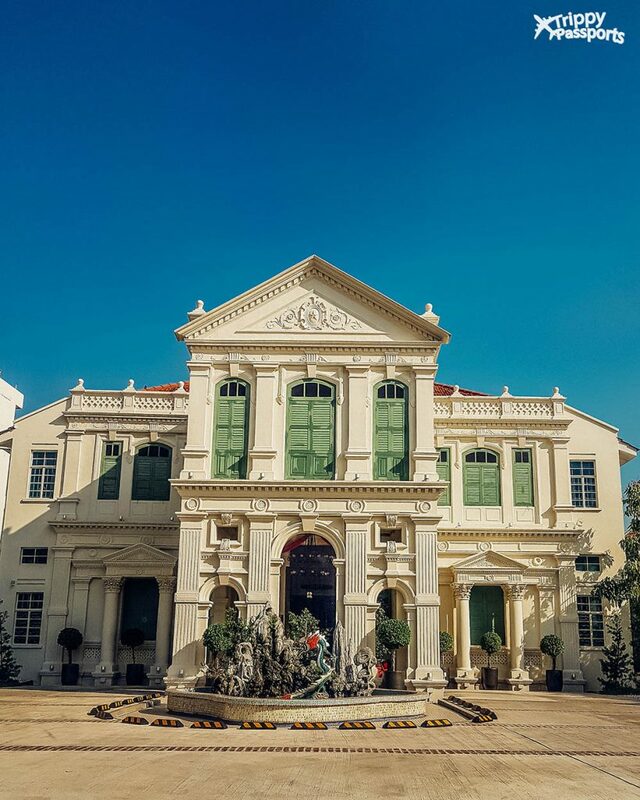 Originally constructed more than 100 years back as a residential mansion, this heritage hotel in Penang gave us a glimpse of George Town from the yesteryears. It was because of our stay at this hotel that our trip to Penang got an added dimension. There are many reasons why I dare to claim that The Edison might be the best place to stay in Penang. 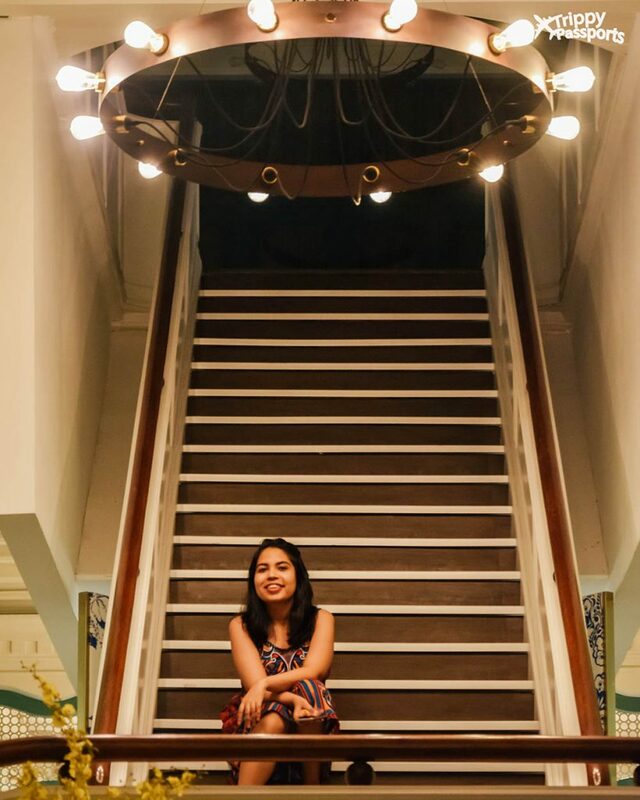 Without further ado, let me take you through our experience of staying at one of the most unique hotels in Penang and share with you why it was so special for us. 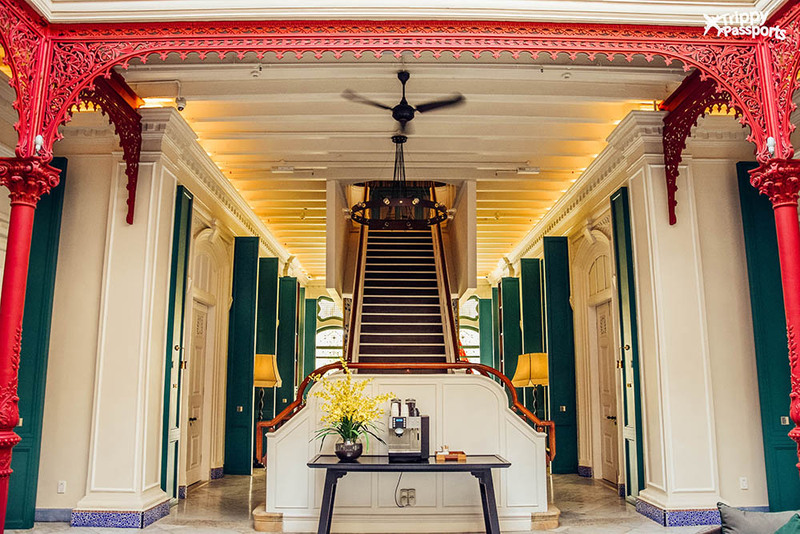 A restored mansion redesigned as a boutique hotel in Penang – that’s The Edison George Town in a nutshell for you. 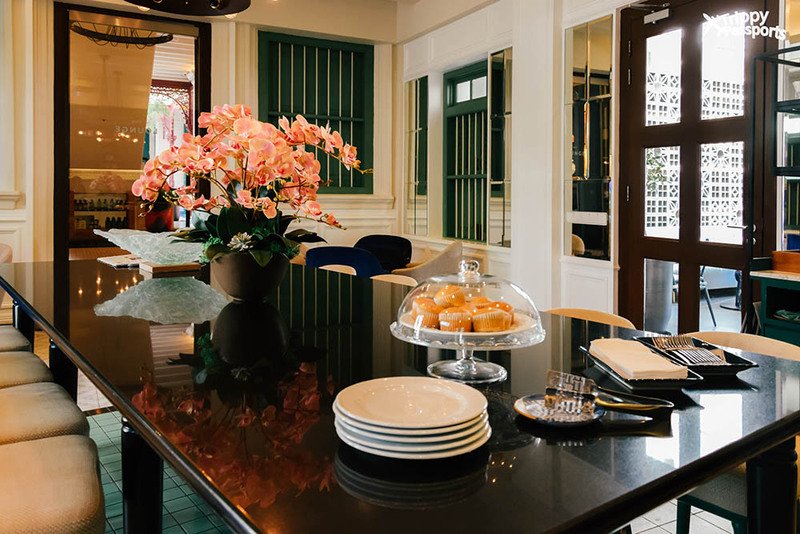 A relatively new property in the thriving travel scene of Penang, this hotel presents a slice of history to you as you drive into the spacious driveway. One glance at the massive white structure, and you can’t help but notice the striking little details that are unlike anything you may have seen in other hotels. Prominent among those were the white ornate pillars and the green wooden shuttered windows that caught our attention. As we parked our vehicle and walked in through the antique wooden doorway, we immediately caught a sense of what we were walking into! We were warmly greeted by two staff members at the reception who very swiftly completed our check-in procedures in less than 5 minutes. Once our luggage was unloaded from the car and parked in our designated room, one of the staff members took us on a tour of the property, while sharing stories from its past. 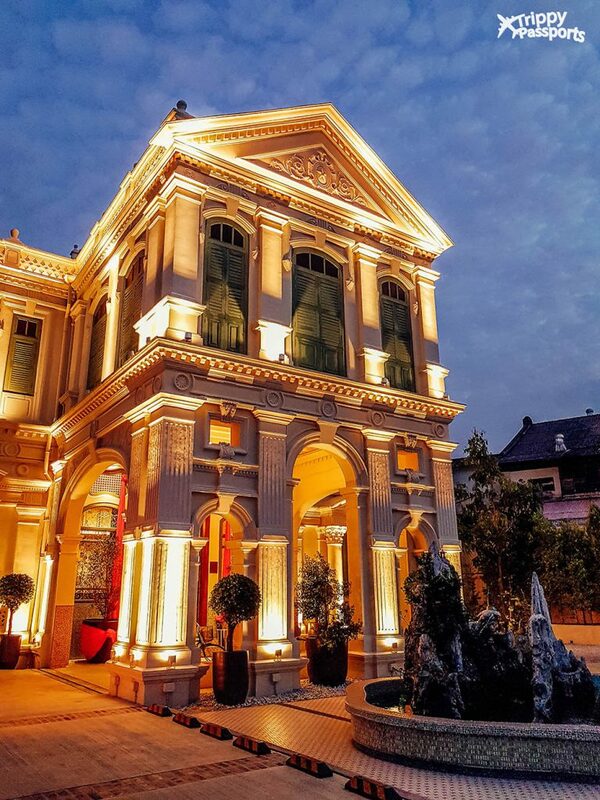 The Edison, as it turns out, was built in 1906 as a residential mansion for a Chinese business tycoon named Yeo Wee Gark. Some years later, his son apparently lost ownership of the mansion in a gambling spree. The property was much later bought over by a budget hotel company which shut shop in 2013, after which the ET Group took over and converted it into the present day luxurious boutique hotel that we see! That’s quite an eventful history for a hotel, isn’t it? Coming back to the mini tour of the property, we were shown how some parts of the hotel have been kept intact, just the way it was originally constructed. For example, the staircase going up to the 1st floor is from the original design and so is the central open courtyard. It was encouraging and refreshing to see that the current owners have been able to preserve some unique aspects of the property and not given in to the temptation of completely overhauling it. 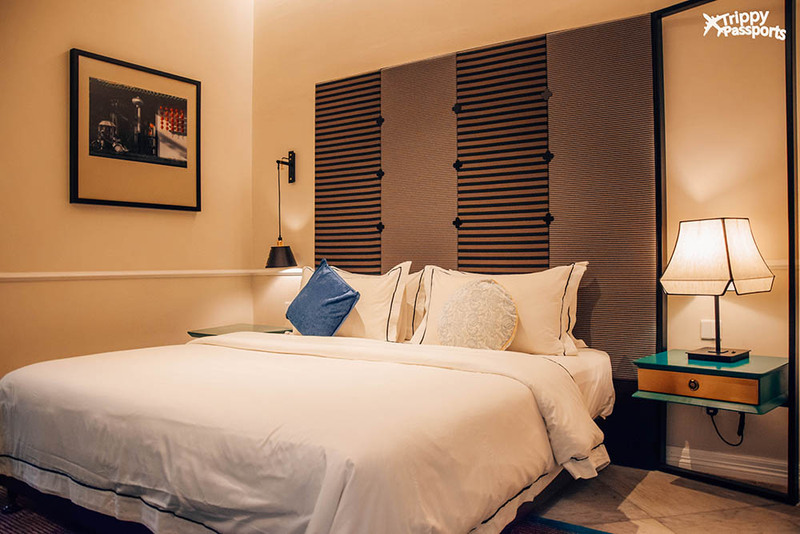 The Edison Georgetown is also a part of the prestigious group of Small Luxury Hotels of the World, one of the very few hotels in Malaysia to be affiliated to the group and the only one of its kind in Penang. If I had to pick one thing that I loved the most about this property, it would be its ability to seamlessly blend heritage and modern luxury and present a beautiful experience to its guests. The Edison currently has 35 spacious and aesthetically designed guest rooms across two floors. During our 2 nights stay, we put up at one of the Deluxe rooms on the ground floor, right across the courtyard. A white vintage wooden door welcomed us into our room and we already knew we were in for a good time! 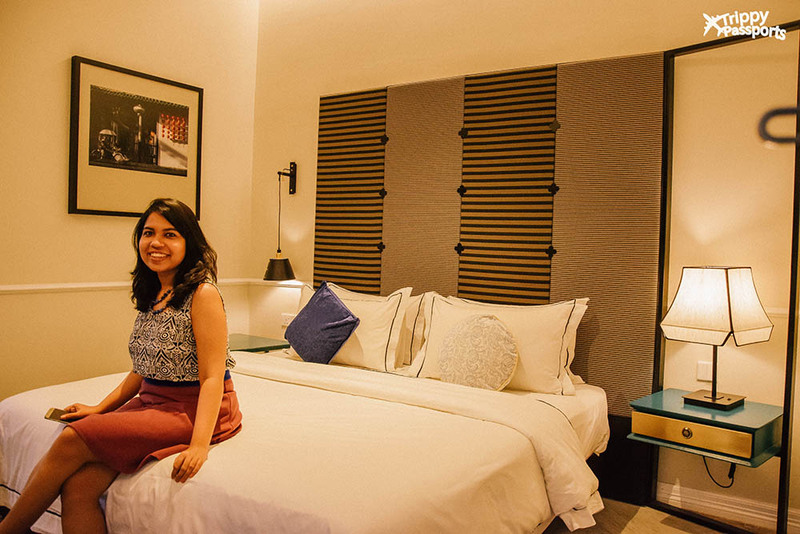 Aesthetically furnished with minimalistic wooden furniture and warm ambient lights, the pleasant atmosphere of our room was a welcome change from the scorching sun outside. The large, comfortable king-sized bed with a warm fluffy blanket definitely looked inviting after having spent all morning on the road! But before diving into the bed, which would most definitely make us doze off, we thought of checking out the rest of the room amenities. And let me tell you, The Edison sure knows how to do luxury right! The bedroom space leads to an open closet and bathroom, separated by a curtain. The idea to not have partition walls within the room is quite clever since it made the bedroom and bathroom feel much more spacious. The bedroom had all the basic important amenities in place – a flat-screen TV, bedside reading lamps, a study table and chair, adequate charging points and a safe. Drinking water was also abundantly and freely provided and replenished every time we ran out of it. 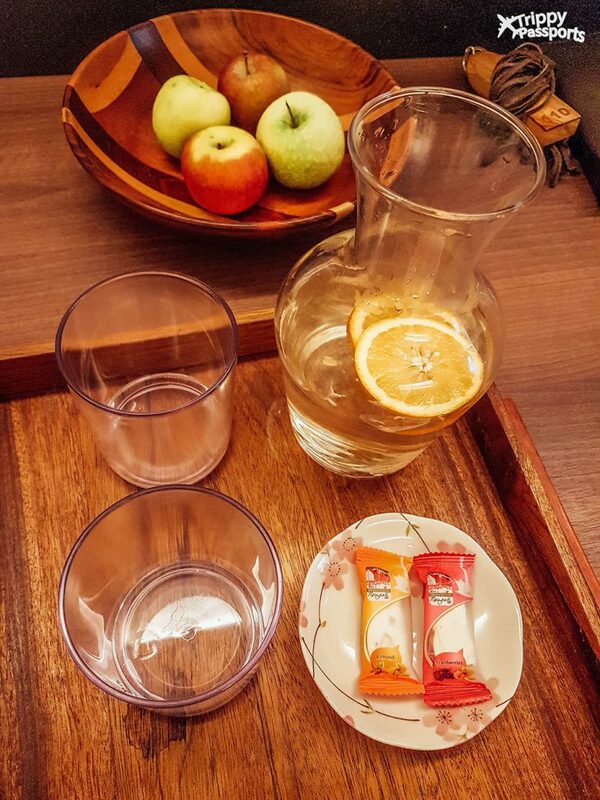 I’ll have to admit, that jug of water with slices of fresh orange was indeed quite yummy and we needed several refills throughout the day 😛 And not to forget the special nougats in a variety of flavours that came in every afternoon – happiness does lie in the small little things! The dressing and bathroom areas felt quite luxurious too. 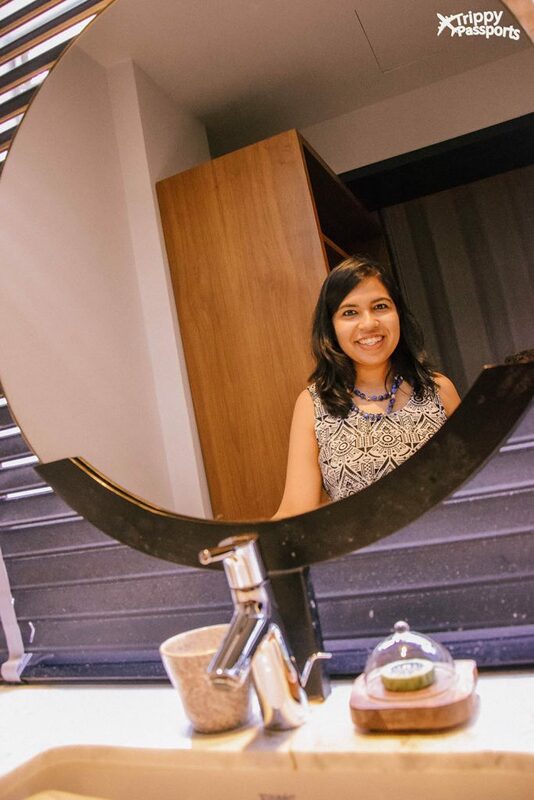 The dressing space had a stylish wooden closet and a large mirror, along with good quality toiletries and fresh towels kept for our use. Two bathrobes were also kept on one side that later came in handy for our trips to the pool. The shower section had more bath toiletries and was equipped with a rain shower, perfect for relieving the day’s stress from walking around in that sun. 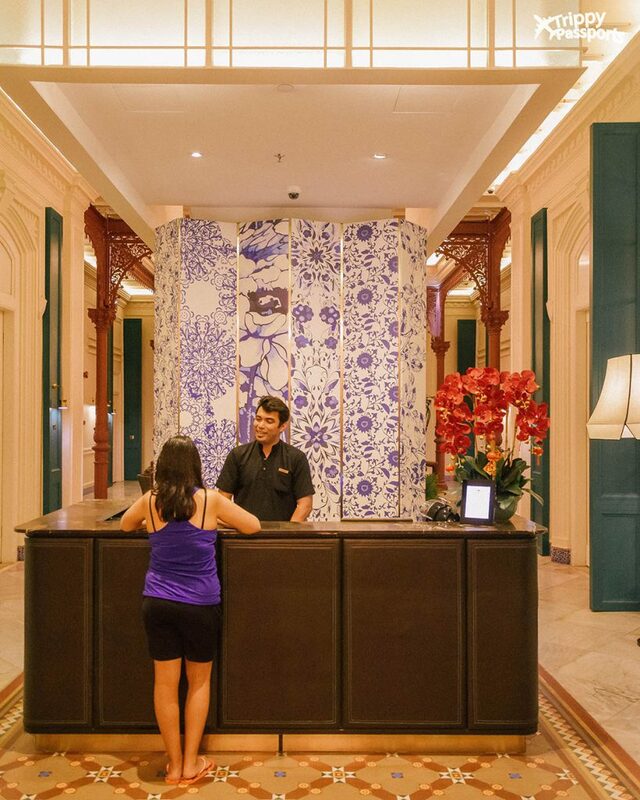 The Edison Georgetown proudly claims to have an all-inclusive arrangement for all guests. So all you need to do is pay for your room and everything else comes along with it! 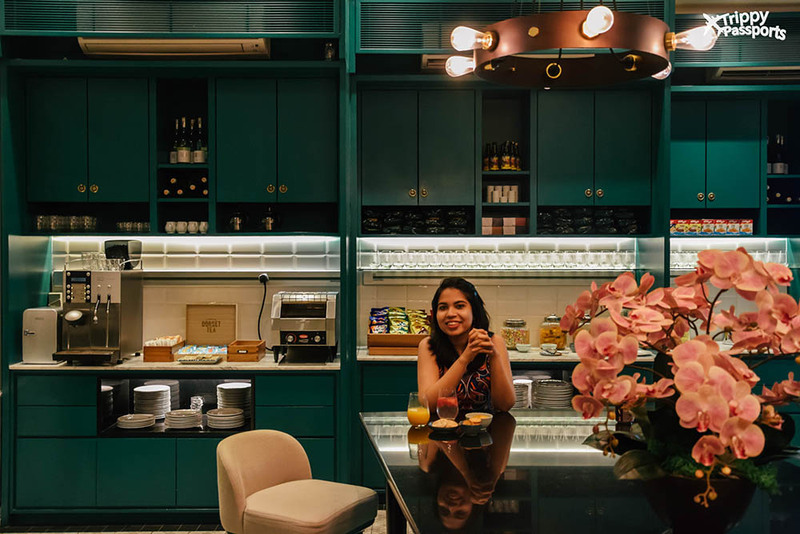 This simply means that once you’ve checked into The Edison, you don’t need to pay any additional amount for any of the food & beverage on offer – breakfast, all day snacks, afternoon tea as well as an evening wine session. This thoughtful gesture is meant to keep the guests’ stay as hassle-free as possible. 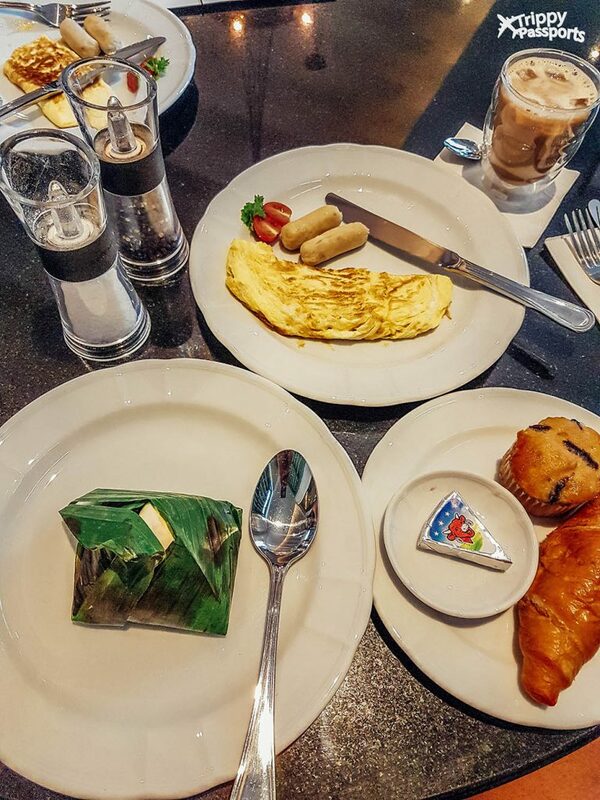 The complimentary breakfast every morning comprised of some local as well as international choices. Nasi Lemak (flavoured rice cooked in coconut milk, served with boiled egg, anchovies and chili sauce) is a widely popular Malaysian breakfast dish and these would be available for us to enjoy fresh every morning. 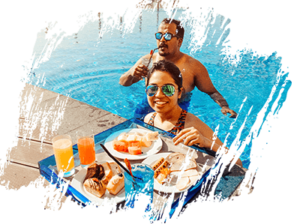 If you are not too keen on that, you could opt for a more continental breakfast of bread with fresh homemade preserves, eggs made to order, fresh fruit juices, tea or coffee and fresh tropical fruits. This was all served as a buffet so you are free to take your pick. Another highlight of our dining experience at The Edison was the afternoon tea session. Those who know me will tell you how much I love tea. But let me tell you that I’m almost addicted to my cup of afternoon tea 😛 So you can imagine how crucial this tea session at Edison was to my survival and how much I would have cherished it! And of course, in Asia, there’s always a little something to go along with the tea. 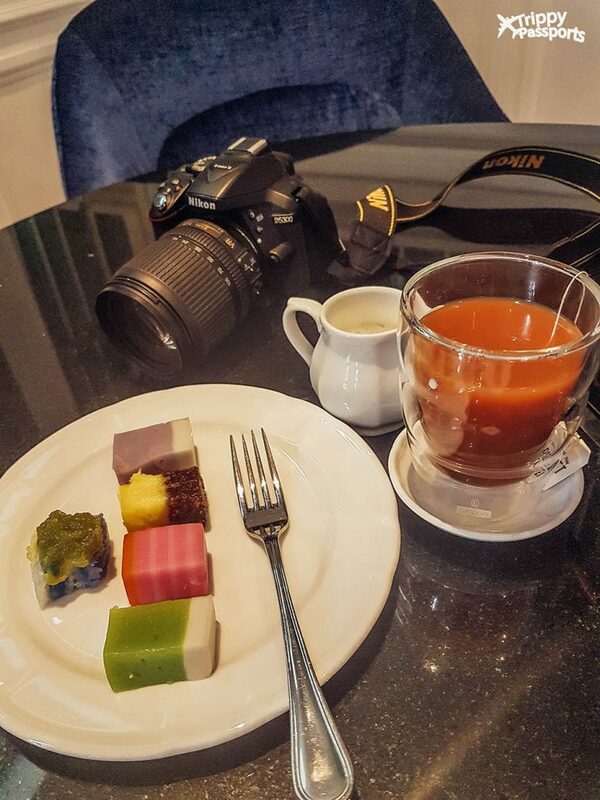 In this case, we were served freshly baked muffins as well as a traditional Malaysian snack called Kuih Lapis (mildly sweet steamed and layered cake made from rice and tapioca flour). But all that aside, have you ever stayed at a hotel that offers complimentary unlimited wine flowing for ALL guests, every day of the week? We surely had not, until we experienced it at The Edison! 6-7 pm on all days is when happy hours are celebrated at the property. Pour yourself a glass or three of red or white wine with a side of assorted cheese, roasted nuts and fresh fruits. If this doesn’t set you up for a kickass evening ahead, we don’t know what will! 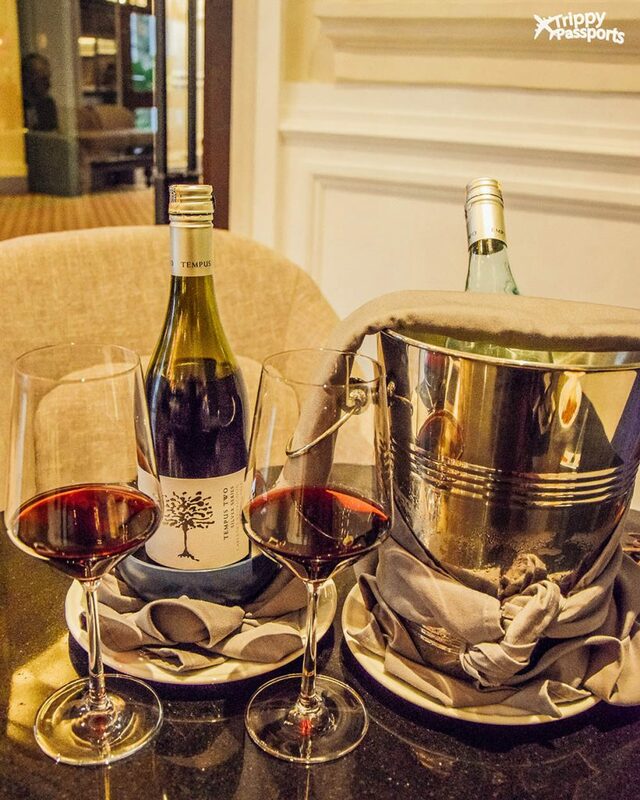 All meals and drinks at The Edison are served at a plush lounge located at one end of the ground floor corridor. The lounge was undoubtedly our favourite space at the hotel. It felt luxurious without being overly flashy. Perfectly lit, decorated in warm tones, this lounge was a great place to relax in at the end of a long day outside. 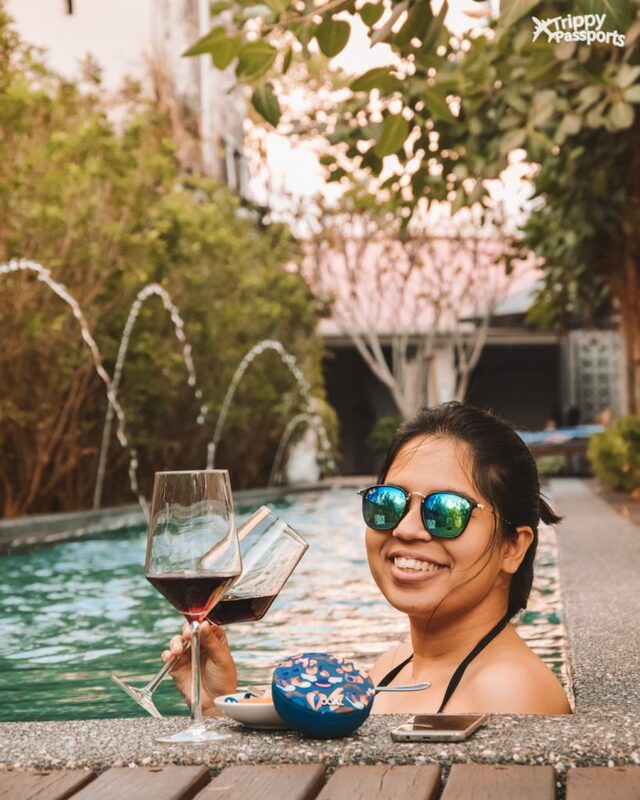 The weather in Penang can be really hot and humid, so kicking back with a glass of red wine during the daily wine session was something we really looked forward to. Breakfast is also set up in this space and so is the evening tea. 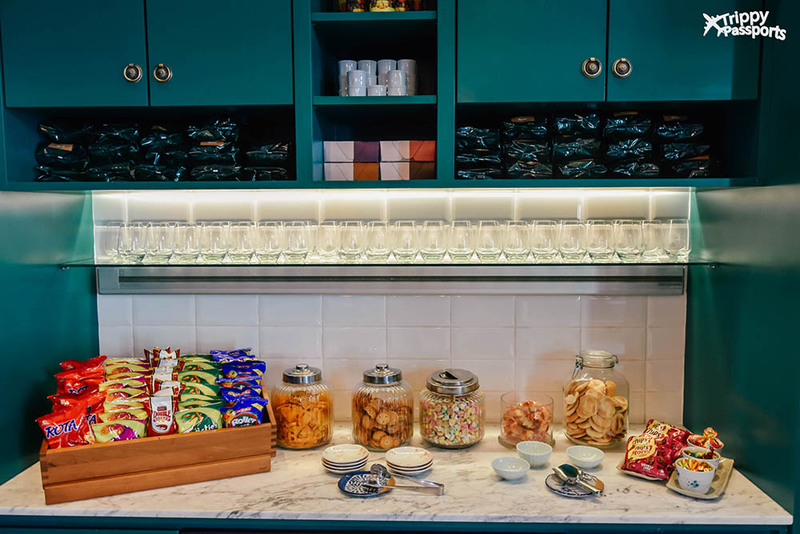 What was even more fun was that the lounge would always be stocked up with snacks of all kinds – cookies, nuts, yogurt, chips and even had a section of non-alcoholic beverages. This is accessible 24 hours of the day so you can say goodbye to those untimely hunger pangs! If you want a change of dining space, you can also choose to sit at the gorgeous al fresco-style lounge. 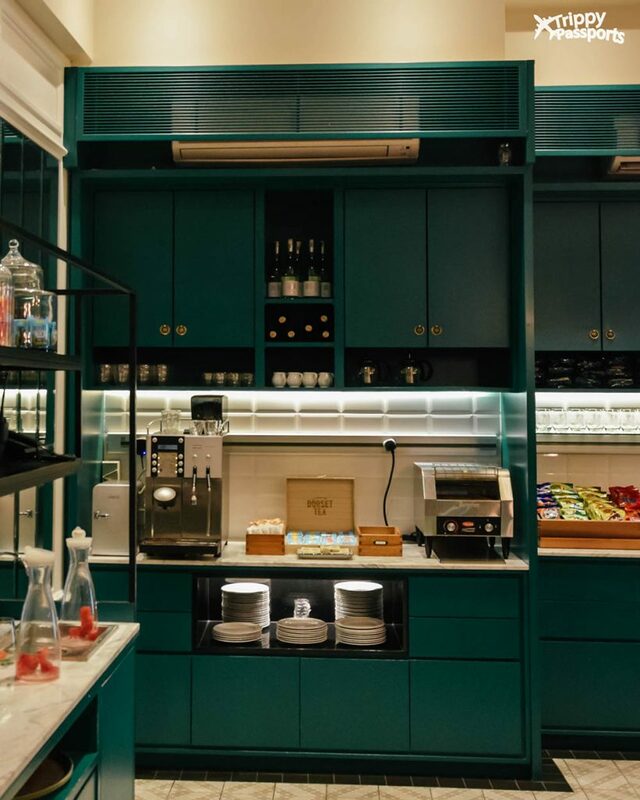 It’s a very comfortable space to not only have meals but to also just relax and take in some fresh air. But all this apart, you might be wondering, what about lunch and dinner then? Well, those two meals are not served in-house and for a very good reason. 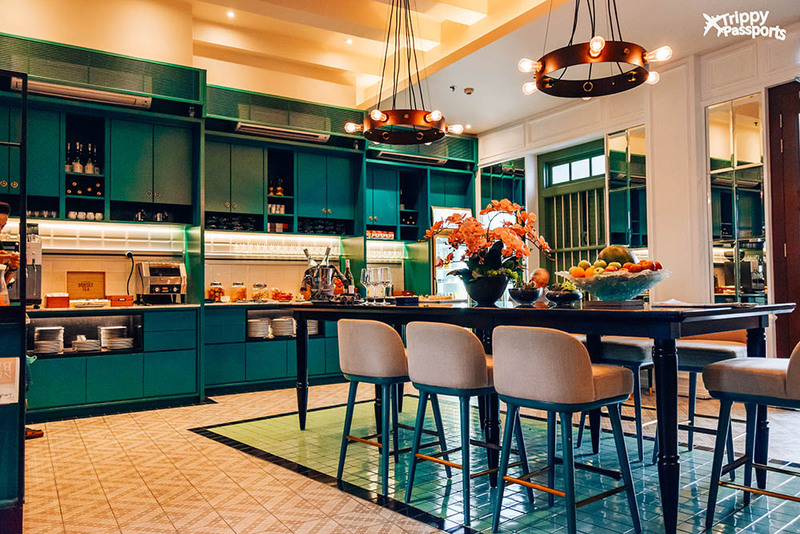 The Edison wants to encourage its guests to explore the bustling local food scene of Penang and go on a street food adventure only possible in this town! We cannot help but agree. The street food culture in Penang is massive and it is very rightly known as the food capital of Malaysia. So if you just stick to curated buffet meals at your hotel, you are really missing out on this experience. With a 25-metre long swimming pool and jacuzzi in place on one end of the property, no points for guessing what we did at the end of the day during our stay at The Edison! Surrounded by greenery, the pool area almost gave us tropical feels. It was big enough for us to swim a few laps since we also managed to get there at a time with no one except us. The poolside beds were also very useful for keeping our belongings and then plonking ourselves on them after a swim, with a glass of wine. The Edison also has an in-house library that is well stocked for your holiday reading. We did not, however, have enough time to explore it because the outdoors were too exciting to resist! And if you’re like us who jumps at every possibility of heading out to explore a new city, but find it too tiring to walk around all day, the hotel has several vintage bicycles parked at the driveway which you can borrow for a quick tour around town. Best alternative to walking, we say! 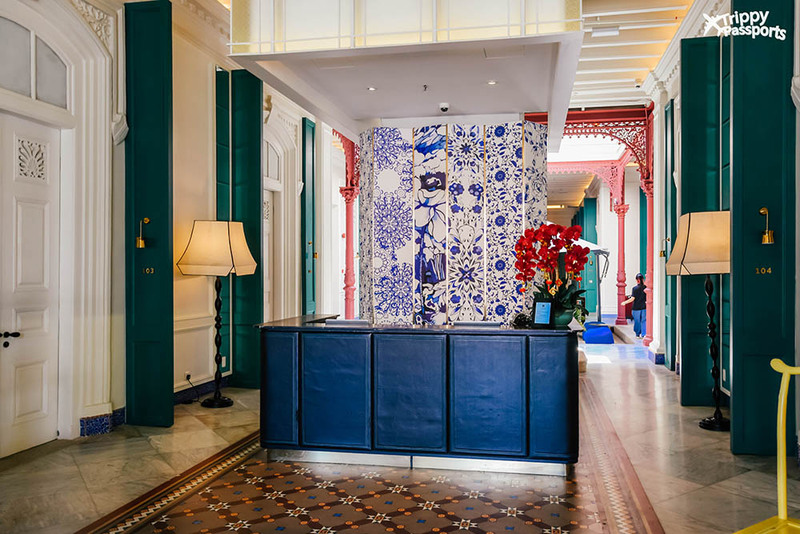 The Edison is located in the heart of all the action in Georgetown, bang opposite to the Cheong Fatt Tze Mansion, popularly known as the Blue Mansion, which is one of the most popular tourist attractions there. With such an easy to spot location and a distinct outer appearance, it is very hard to miss The Edison. As you can see in the map below, there are tons of things to do and see in the vicinity. The street arts that Penang has come to be known for, are just around the corner. An added benefit is the easy availability of a wide variety of local food in the surrounding areas and most of these places are easily walkable. So our evenings mostly involved us taking a lazy stroll to Chulia street to gorge on the delicious hawker food. But what is unique about The Edison is how beautifully it is able to maintain its poise and calm amidst all the chaos. So even though you are never too far from all the excitement, you are still assured a peaceful night of sleep at the end of the day. 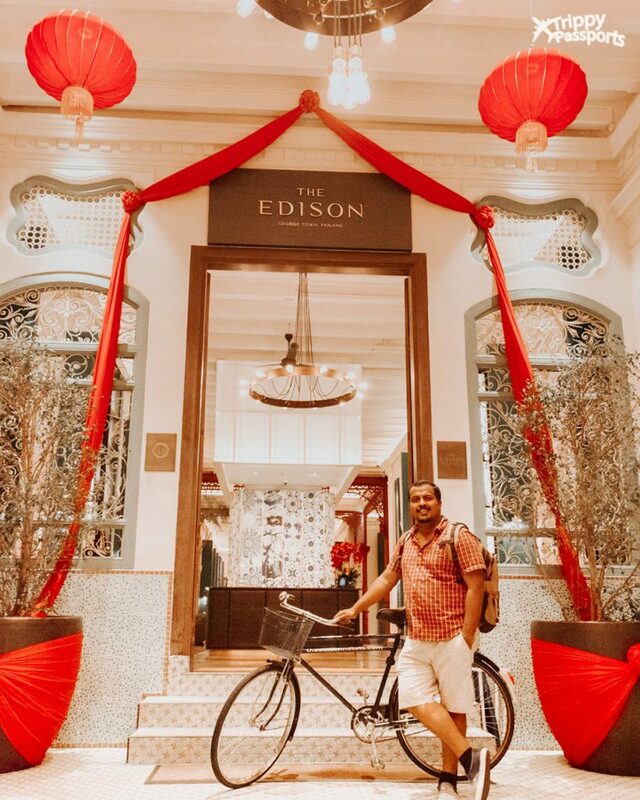 Our experience of staying at The Edison George Town far exceeded our expectations! And it was probably one of the nicest heritage boutique hotels we have had the chance to stay at. There’s something about this property that makes it feel very homely and personal, but without any compromise on the luxury quotient. 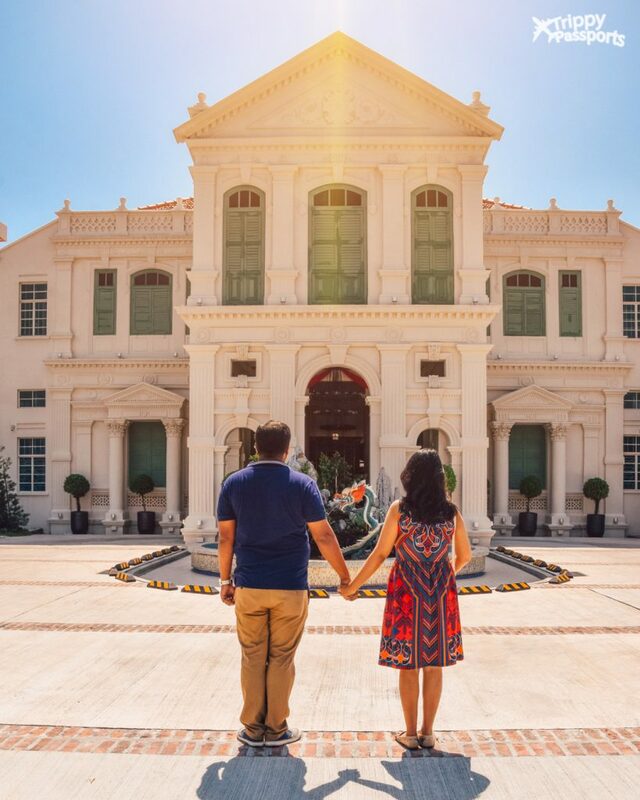 Brilliant location, beautiful architecture and a perfect blend of heritage and luxury make The Edison is a beautiful place to stay in Penang for couples as well as those traveling with kids. 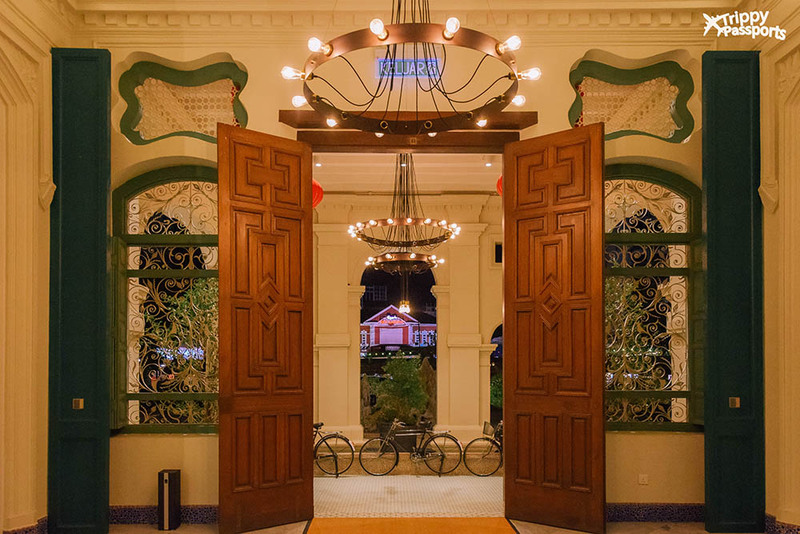 We have no doubt that The Edison George Town permanently has our hearts and that is only possible for those hotels that have their own hearts in the right place! 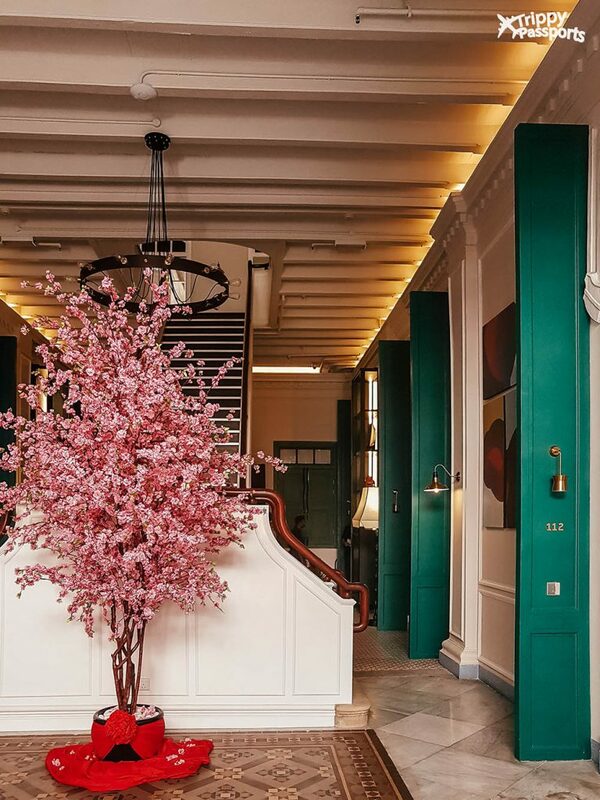 The design details of this hotel are stunning! It has such a cool vibe-equal parts history and modern. And those poolside dranks! That’s my kind of vacay. This looks like such a gorgeous property! So nice to see such a well designed hotel with so much history. Thank you for sharing! I just got back from Penang and walked past the Edison and thought it looked gorgeous. Am so glad i found your post so I could look inside. Will definitely consider it for our next visit. A hotel with character and history that is walking distance to a chocolate museum? Sold! Thank you for the great info, I love the photos.